Politicians and Twitter - a passing fad or long-term communication vehicle? 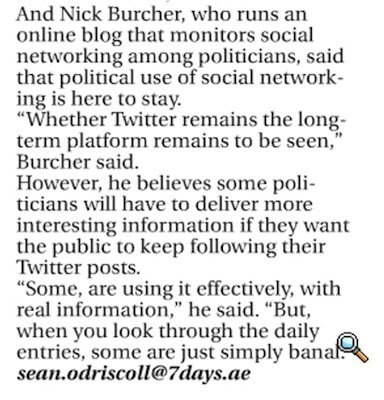 Dubai newspaper 7Days.ae have featured my comments in an article about politicians and Twitter / social networks. 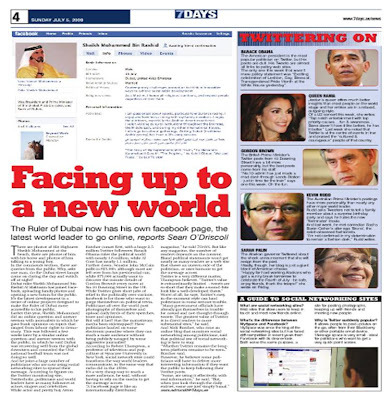 The article was inspired by the UAE prime minister, Sheikh Mohammed Al Maktoum, who is now on Facebook and doing q and a sessions with the public online - and with 773,280 Facebook users in the United Arab Emirates, Sheikh Mohammed Al Maktoum has a large potential audience. Indeed, I believe that the principle of politicians using the internet to bring more openness to government is here to stay, though whether Twitter remains the long-term platform remains to be seen. Web 2.0 has transformed consumer expectations of organisations and you only have to look at the recent Parliamentary expenses scandal to see that the UK public want greater insight into the workings of government. Other prominent UK examples of political twittering include @mayoroflondon who used Twitter in his election campaign and continues to tweet to connect with Londoners, whilst @DowningSt tweet about the Prime Minister's daily activities (and now have close to 1 million followers). However, whilst politicians can use Twitter as an outlet to provide direct communication with the public (removing the risk of a journalist distorting the message), there are potential pitfalls. As Robert Thompson says in the 7days article "many government officials have already got themselves in trouble for casual and not-thought-through tweets." 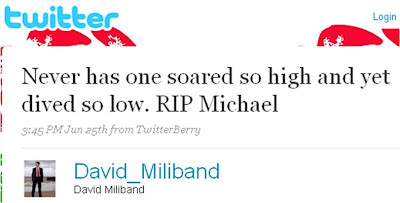 It is also interesting to note that news organisations are sourcing stories from Twitter and then relaying them through 'traditional' news channels - though recently they have been caught out over David Miliband where Twitter imposters managed to dupe national press resulting with reporting (what they thought to be) a David Miliband Michael Jackson Twitter tribute. As the UK general election nears then interest in UK politicians twittering will surely rise. Twitter gives politicians a (real time) direct platform for information dissemination and as time goes on (and more MPs get involved / understand the potential value of twittering) then Twitter's role in UK politics will increase. We have already seen David Cameron experimenting with hashtags in a recent speech (#AskDC) and I'm sure there is more to come. Start following your MP now! Thanks for the tip! Also interesting to see that the UK Prime Minister (and lots of others) are now getting involved in the #welovethenhs debate that is currently trending on Twitter.